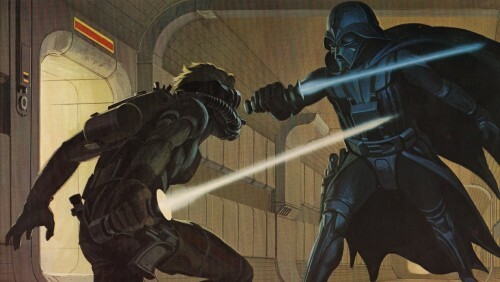 I think this was done by Ralph MacQuarrrie, during pre-production of the original (probably done in 1975 or ’76) primarily to flesh out what Vader would ultimately look like. I gotta wonder how far Lucas had the script worked out, what with Vader’s opponent being somewhat ambiguous (wouldn’t surprise me if it was still “Deke Starkiller” at that point). I highly prefer this version of the protaganist. General Anakin Starkiller vs Vader! Me no think good before coffee have I… huh? Ever since I got a glimpse of all the concept art I’ve had an internal debate on which ones I like better.